Story: Bank janitor Charlie gets involved in a romantic entanglement, then day-dreams he heroically sees off a group of would-be bank robbers. Production: Having produced two films—Work in June and A Woman in July—after a long break, Charlie Chaplin appeared to be settling into a regular release schedule, issuing a new short on a monthly basis. This would be maintained with The Bank in August 1915, but just as his work was reaching new heights with this short, Chaplin was about to take another lengthy hiatus. There’d be no new shorts released until Shanghaied in early October. Chaplin had shown the capacity within his Tramp character (a figure he was coming more and more to regard as the ‘Little Fellow’ or an everyman archetype) for unexpected pathos in his short The Tramp, released back in April. His subsequent short Work had seen him develop serious themes within his storytelling, while the following film A Woman had allowed Chaplin to have some fun exploring his feminine side. None had really adequately built on the expansion of the character seen in The Tramp, although it had been an issue Chaplin had been wrestling with in between moving studios, twice. Now, with The Bank he had a thematically serious storyline that also allowed for him to bring new depths to the ever-evolving character of the Tramp. As usual, Chaplin’s Tramp has found a lowly form of no doubt temporary employment as the lowly caretaker at a large bank. He’s fallen in love with the boss’s secretary (Edna Purviance), although she has barely noticed him, due to a mis-reading of a note she intends for the cashier. The only way he seems able to both catch her attention and act out a heroic adventure is in his idle day dreams, echoing ‘Jimmy the Fearless’, a well-travelled vaudeville stage comedy Chaplin had played in a few years earlier, mixed with echoes of his old Keystone short, The New Janitor. The opening sequence is an example of masterful comic misdirection. The indications are that the Tramp has made something of himself at last as he enters a big city bank building, almost but not quite as if he owns the place. He confidently makes his way down into the vaults where he is confronted by a massive safe. Surely only someone of great importantance would know the combination to such as safe, as Charlie seems to. As he opens the door he pulls out… a bucket, a mop, and his janitor’s uniform. Knowing a good joke when he saw one, Chaplin re-used the safe gag a year later in The Pawnshop (1916), this time retrieving his lunch. Flowers as a motif would become central to the pathos Chaplin would henceforth build into his comedy. We’ve already seen the Tramp associating a flower with romance at the start of A Jitney Elopement, while in The Tramp he is intending to give Edna a flower as a token of his love, but is too shy and instead throws it away (into a milk bucket). The Bank is the first time, though, that flowers are seen to be used in this way in an extended sequence, recurring twice through the film. Later films continued the motif. In Sunnyside (1919) as the Tramp spies on Edna he absentmindedly pulls the petals from a daisy, and in the dream world featured in The Kid (1921), flowers abound. According to critic Gerald Mast, for Chaplin ‘flowers become surrogates for the real human beauty [the Tramp] wants to possess, he can at least hold a flower, if not the lady for whom it is intended.’ The pinnacle of this use of flowers in dramatic gestures would come in City Lights (1931), in which the object of his affection is a blind flower seller (Virginia Cherrill). He buys flowers from her at the start of the film and again at the climax, when it is revealed through this act that he has been her benefactor. Images of flowers recur throughout City Lights—such as during the scenes where he rescues the would-be suicide by the quayside—and provide the central metaphor for femininity as perceived by Chaplin. In these earlier films we see the first sketches for ideas he would more fully develop later in his features, including The Gold Rush (1925) in which prospector Charlie keeps Georgia Hale’s rose under his pillow and even Monsieur Verdoux (1947), where the romantic assassin sends flowers to his prospective victims. Once again, The Bank was shot in and around some key locations in Los Angeles. The building that houses the bank itself was the Trinity Auditorium, located at 851 South Grand Street in Downtown Los Angeles, as revealed by author John Bengtson in his book Silent Traces. It was an unusual building, with the first three stories housing not a bank but a church, while the upper six stories featured men’s dormitories consisting of 330 rooms. Essentially a site for self-improvement run by the church, the building included a rooftop garden and any manner of facilities from a barber shop to a library. It opened just a year before Chaplin used it as the site of his bank, and it was often used in the 1930s as a venue for jazz concerts. More recently, it has been converted into a high end hotel. The interiors for The Bank were shot on sets constructed at Chaplin’s rented facility at the Majestic Studio, although as was often the convention in silent film many of these supposedly ‘interior’ sets were actually built on open air stages to make better use of the Los Angeles light. While he was developing more depth for his own character, Chaplin wasn’t sacrificing the comedy in his shorts to do so. As well as the opening gag, there’s a classic moment when asked to post a letter, Chaplin’s Tramp assess a bank customer as though he is ill, enticing him to stick out his tongue, so allowing the Tramp to wet the stamp he needs to stick on the letter. The same letter won’t fit in the mail slot, so the Tramp’s innovative solution is simply to tear it into three pieces and post each one individually. Of course, as he’s a janitor with a mop, there is plenty of opportunity to use that as a comic prop. Even before the dream sequence in which the Tramp thwarts the would-be bank robbers, the audience’s sympathy is firmly with him. This version of Chaplin’s Tramp is not the violent imp from the earliest Keystone films. He’s a prankster, but he means no real harm to anyone, and is in fact keen to improve his lot. Naturally, he’d like to do this without actually engaging in any real hard work—and that probably appealed to a lot of his contemporary 1915 audience. More and more, though, as Chaplin developed his cinematic art during his time with Essanay, the Tramp is focused on romance, matters of the heart and eternal heartbreak as his romantic yearnings are very rarely fulfilled. 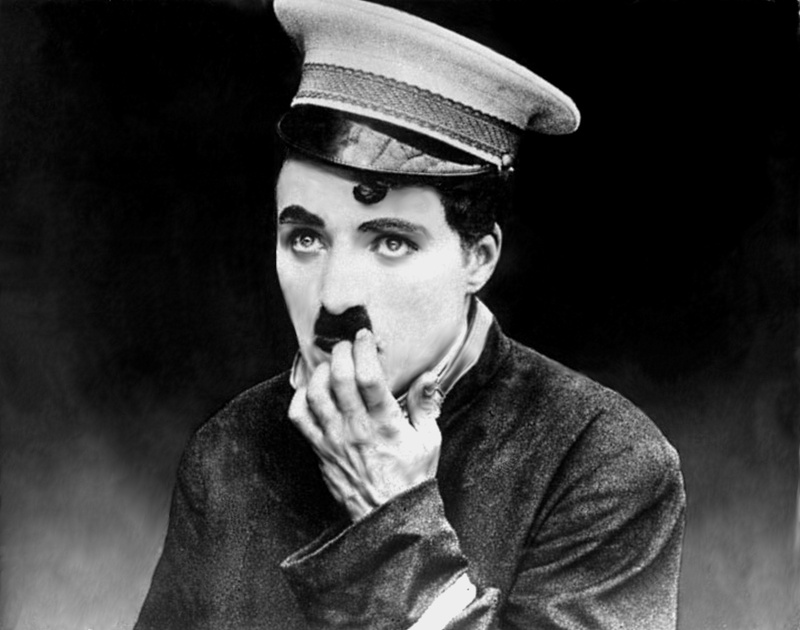 It is significant, given the character development in this short, that for the first time the image of Chaplin used in posters to promote The Bank was not one that suggested simple comedy. The head-and-shoulders image of the Tramp is one that contains emotion, although whether sorrow or anger is not instantly clear (alternatively, he could just be getting ready to sneeze!). It was an indication that for this particular short, and more widely indeed, that Charlie Chaplin was no longer just about the laughs. He was now promising stronger comedy rooted in distinctive character. In The Bank, the optimistic dreamer of Chaplin’s more mature work made his first tentative appearance, providing a pointer to the future of the ‘Little Fellow’. The Contemporary View: ‘It’s the most legitimate comedy film Chaplin has played in many a long day, perhaps since he’s been in pictures. While there were no boisterous guffaws from upstairs [the balcony] that his slapstick would have pulled, the use of clearer material brought some enjoyment to the entire house, also left a better impression.’—Variety, 1915. Slapstick: The first of many mop-tastic ‘accidents’ sees the janitor dip his wet mop into a gentleman’s top hat. In moving the waste paper basket, the janitor turns litterbug, making more mess than he’d cleaned up. Smartly dressed Edna provides such a distraction that the janitor hits himself in the face with his mop. The foot-in-a-bucket gag may seem old now but… yeah, it was old even then. Romantic disappointment leads to day-dreaming, and an action-packed robbery thwarted. While Edna’s boyfriend makes himself scarce, Charlie’s janitor saves the day—shame it’s all just a dream. An 80,000 word ebook chronicle of Chaplin’s early films from Keystone (1914) and Essanay (1915), based on the blog postings at Chaplin: Film by Film with 20,000 words of supplemental biographical essays. This entry was posted in Essanay and tagged Essanay by BJR. Bookmark the permalink.